Searching for sweet and romantic? You’ll be over the moon with this Coastal Vintage Romance Bridal Shower by Bryn Stanbury of Balancing Balloons, out of Seattle, WA, USA! 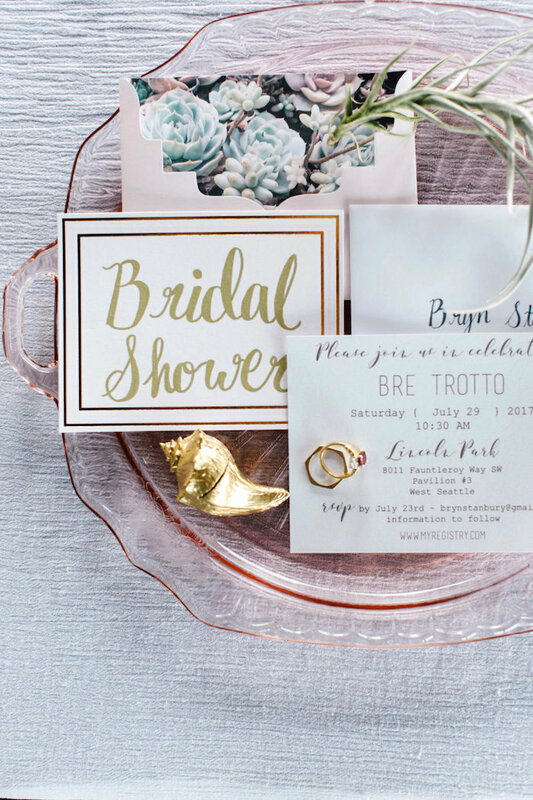 Subtle and charming to the core, this gorgeous party is mi amore! 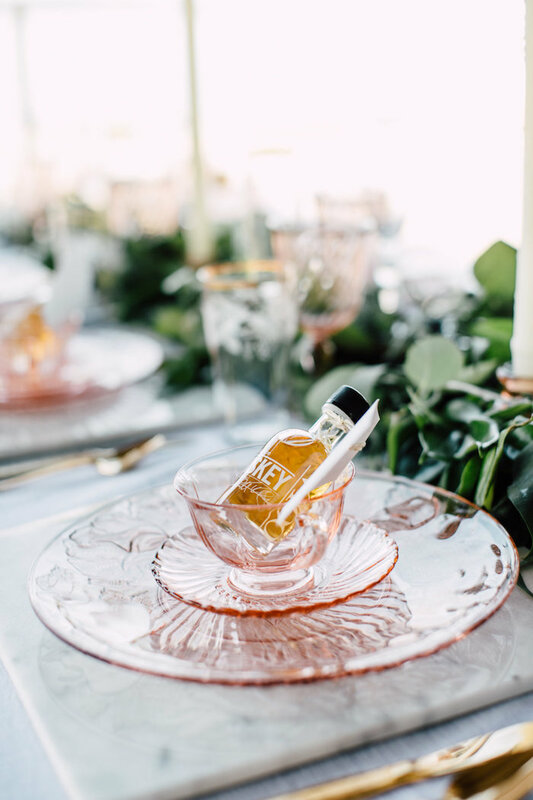 “Recently we joined forces with three additional creative companies to bring together a Coastal Vintage Romance Bridal Shower. The style, design and all tablescape rentals are brought to you by, yours truly, Balancing Balloons. 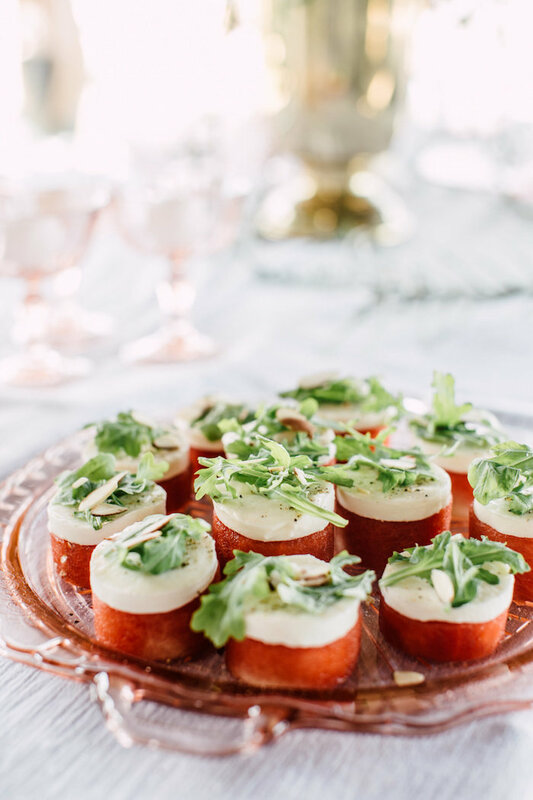 Tawni Eakman Photography captured the setting gorgeously and seamlessly. Desserts by Scarlet Nantes were impeccably designed to suit the setting and our taste-buds were equally delighted. 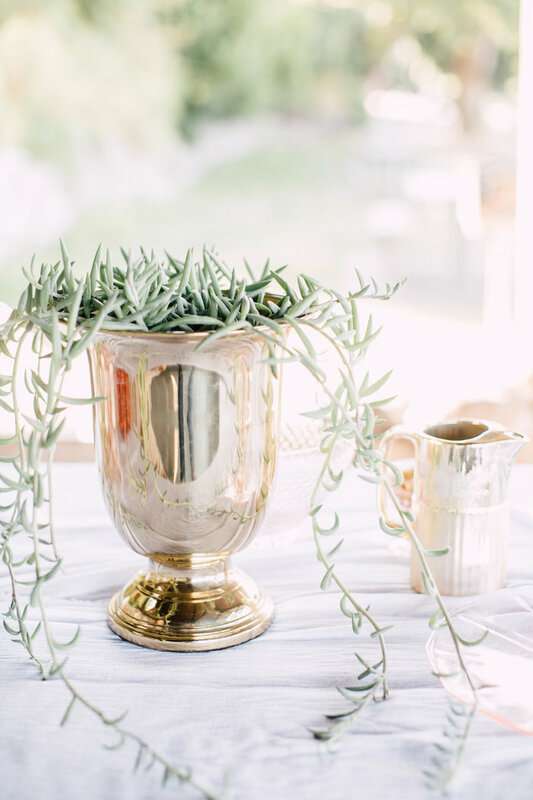 The stunning detailed greenery garland and dessert table centerpiece were designed and created by Petal and Vine. Coastal Vintage Romance, is a bit of an inspirational bundle, but we wanted to touch base on each aspect. 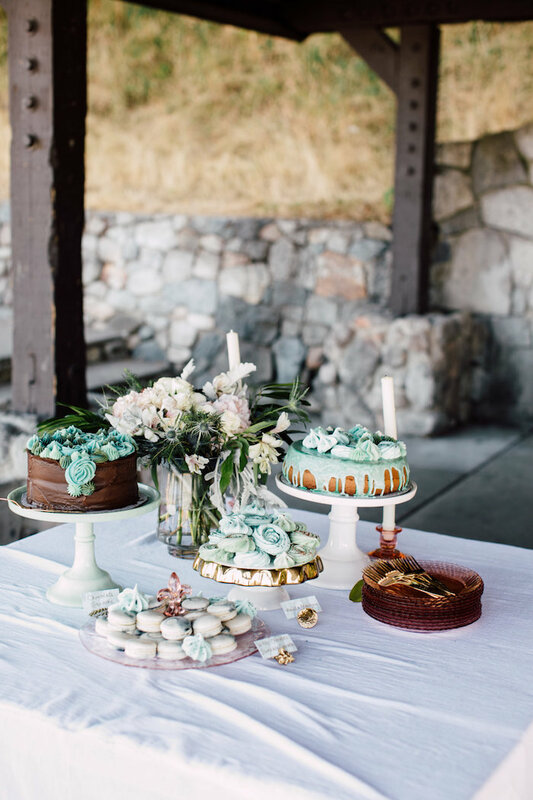 The bridal shower was located in West Seattle at Lincoln Park. The brunch guests enjoyed a view of the Puget Sound while looking across at Vashon Island. Ferry boats were consistently on the horizon, with water lapping on the rocky driftwood beach. Vintage, because we are who we are, our love for vintage is deep! Romance, here we touched on the soft delicate feminism. 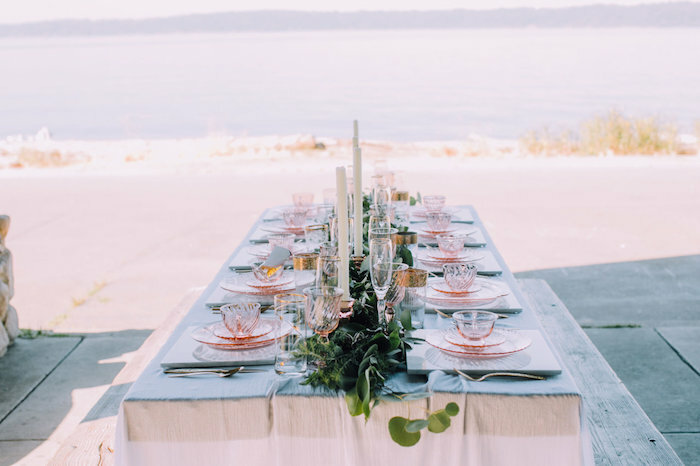 The bride-to-be loves pink, but forwent the hue as a wedding color, because the groom himself doesnt connect with the color. I have to nod my head in appreciation that their marriage is off to a rock solid start, wedding planning and registering to build a home together kickoff the marital dance of comprise! Alas, her bridal shower lent the chance for pink to explode and channel the bride herself. 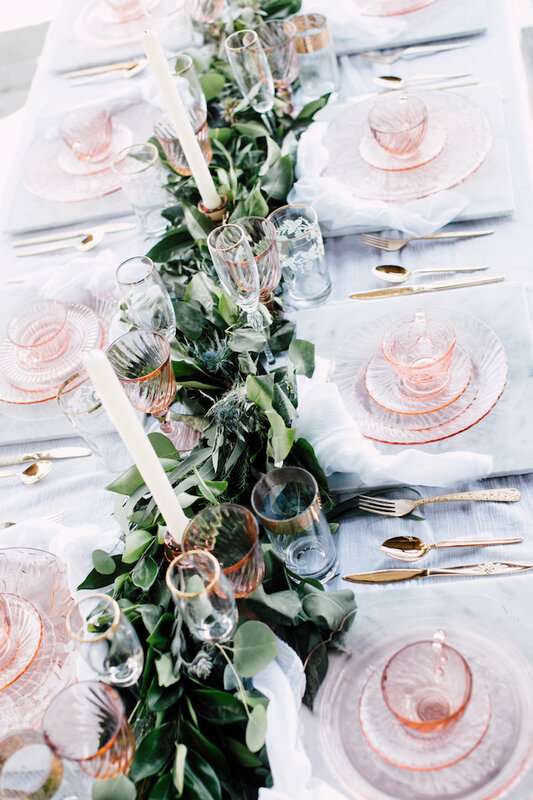 The table was laid with a white gauzy tablecloth, the table runner was a cascading garland of greenery mixed with vintage pink depression glass taper candle holders. 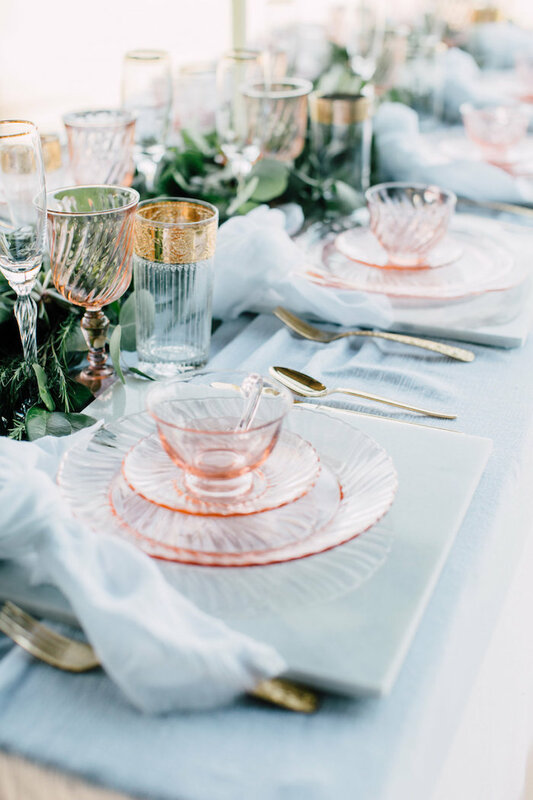 Each place setting consisted of a marble charger, vintage pink dinner plate, gold vintage flatware, teacup(coffee) & saucer, vintage gold accented water glass, vintage pink goblet, and a gold-rimmed mimosa flute. 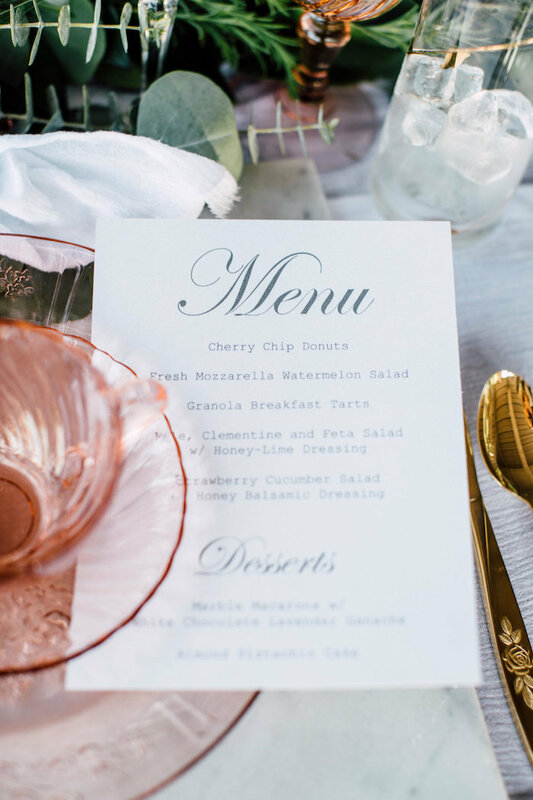 The dessert table had us all wishing we could spoil our meal with dessert first! 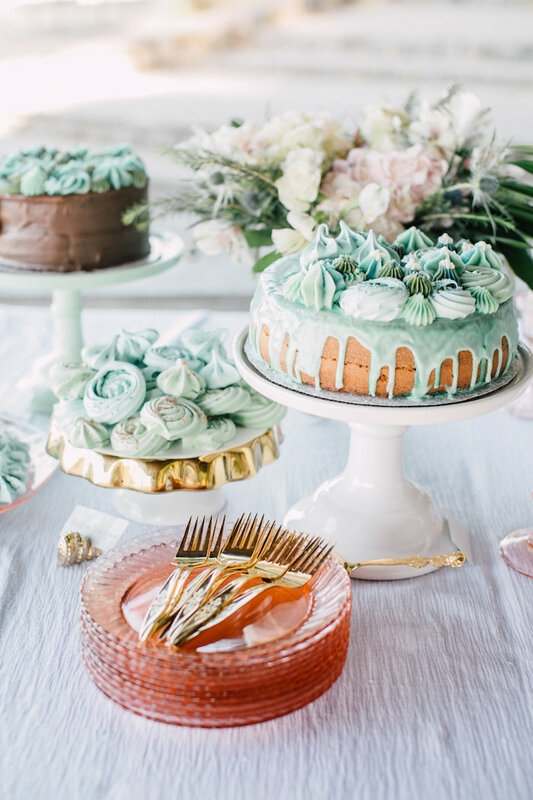 With a slight succulent theme (another of the brides visions that didnt make it into the wedding day design), baker Tanya of Scarlet Nantes created a succulent vision on top of decadent cakes. 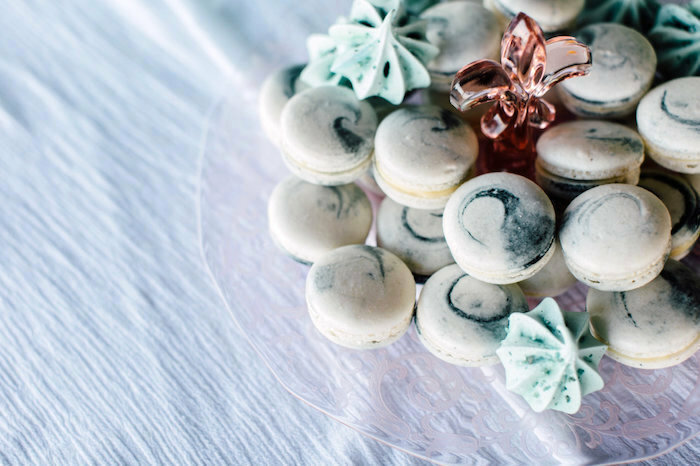 The lavender white chocolate ganache macaroons were also channeled from the marble chargers in the place settings. The Almond Pistachio Bundt Cake was devoured! With the guest of honor being a close friend I was able to caterer detailed touches to her style. 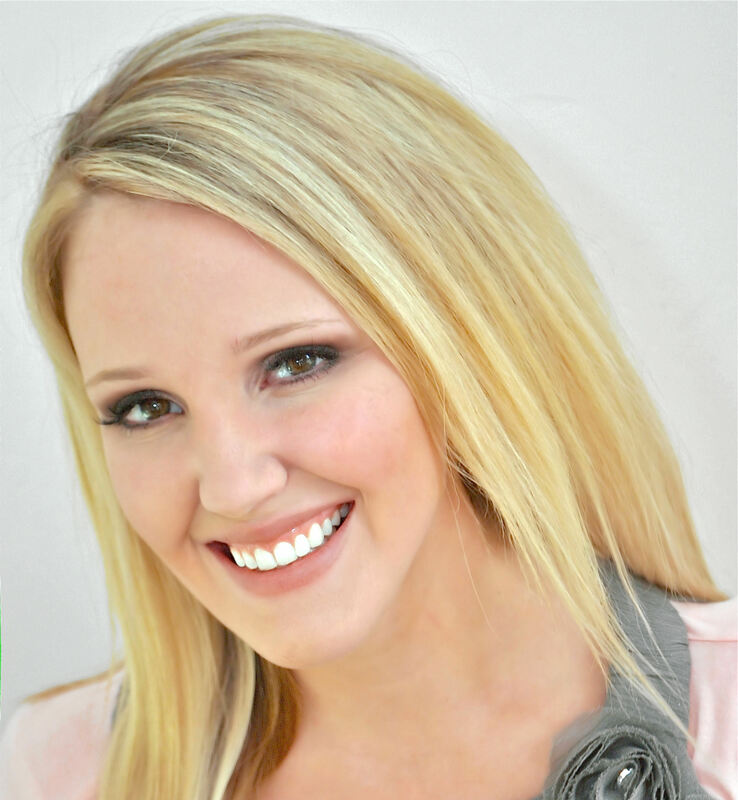 This gold crown, which I found and purchased for her long before she was engaged, was her seat marker. I found the Mrs. crown while planning a baby shower for another friend and couldnt not buy it as it suited this future bride so perfectly. I am now delighted that it had a special place at her bridal shower. 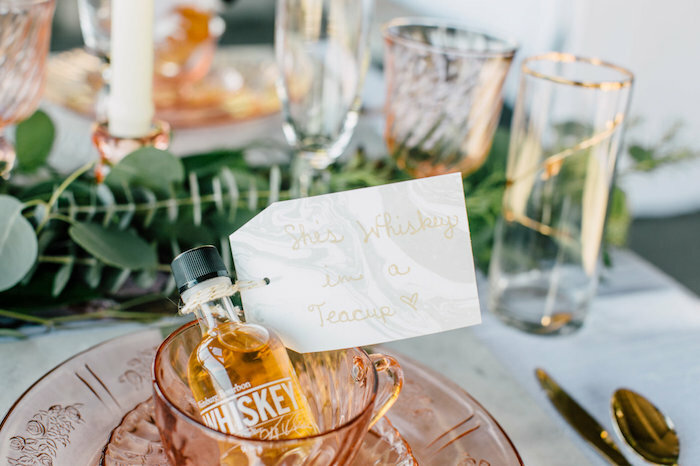 Our bride is oh-so-feminine, but she loves her self some whiskey! Cue, Whiskey in a Teacup! As the hostess gift each of our guests went home with a shot of whiskey from local Seattle small batch distillery Oola. 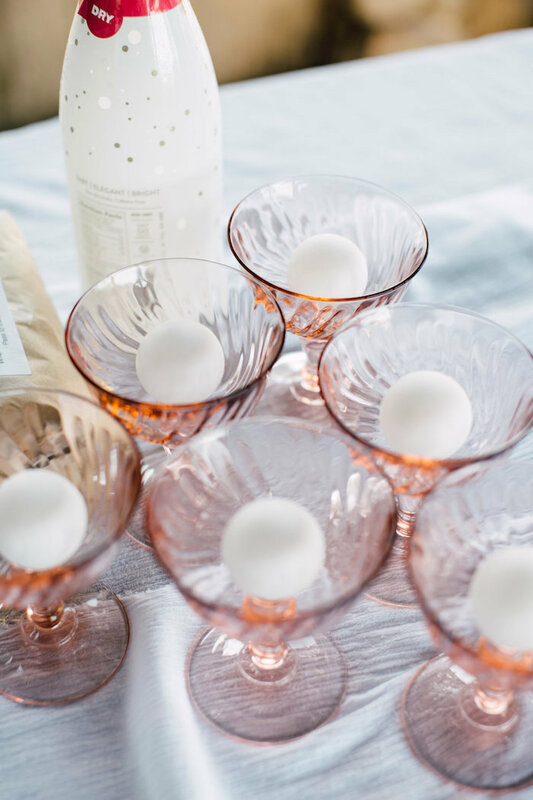 We are always on the search for personal sophisticated party games! One we have adapted from party to party is pass the parcel. A game evolved from my New Zealand MIL. Not positive if its her game personally or a New Zealand party custom. If you are interested, message us and well share the details! CHAMPAGNE – PONG! A classy twist to an old school college drinking game! 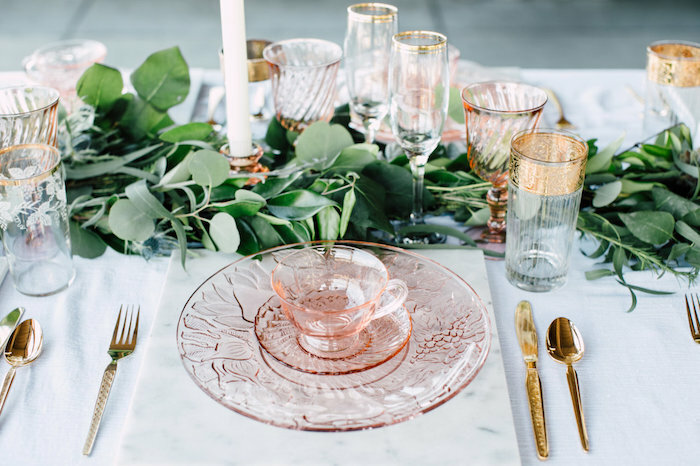 Pour champagne into vintage pink depression glass coupes, even classier!